Front-line executives and their managers are challenged daily at their intensely demanding jobs. Our ops tools are designed to be intuitive and cut to the chase to reduce workload. These low-cost SaaS solutions meet flexibility, security and compliance requirements, integrate and synthesize disparate data sources into a scalable analytics engine that is cohesive with other systems for future integrations. Below are 3 examples: each for a ship-operator, a shipping agent, and a port services provider. COS is the only system specifically tailored for the chemical tanker chartering operations. Its modular plugins give an operator flexibility to pay for only what is needed: Voyage Ops Manager; e-DA Manager; Guided Voy Simulator; Auto-Doc System; Vendor Manager, etc. Each module helps users cut precious time to focus on creating values on subject matter expertise. AGENSEE is a ship-agency operation system that helps small and medium sized companies which rely mainly on manual processes currently. It includes a principal appointment interface, a check-list for the boarding officer, document automation & management, BI, port clearance interface, etc. With it, agents are future-ready and able to start offering digitalised services. B-a-L is a booking and tracking SaaS platform for launch operators in port area. Operators can rid of costly omissions & errors common from manual booking systems. It also improves customers experience (no more arguments on proof of service rendered), standardises accounting & processes, cuts risk of frauds, and raises productivity. Digitalisation is fundamental for maritime transformation to align with adjacent industries in logistics, trade, finance and banking. We help companies adopt and adapt at lowest cost possible to enable such digitalisation process. Intimately understanding maritime industry various nuances and intricacies helps us develop relevant solutions at fractions of the time and cost other IT vendors require. For eg. we created a simple yet beautiful website for a shipping co. at US$2,500 and delivered it within a week, because we could quickly grasp the specifications and develop the product within a few short scrums. Our project team adopts an agile methodology in developing our products. 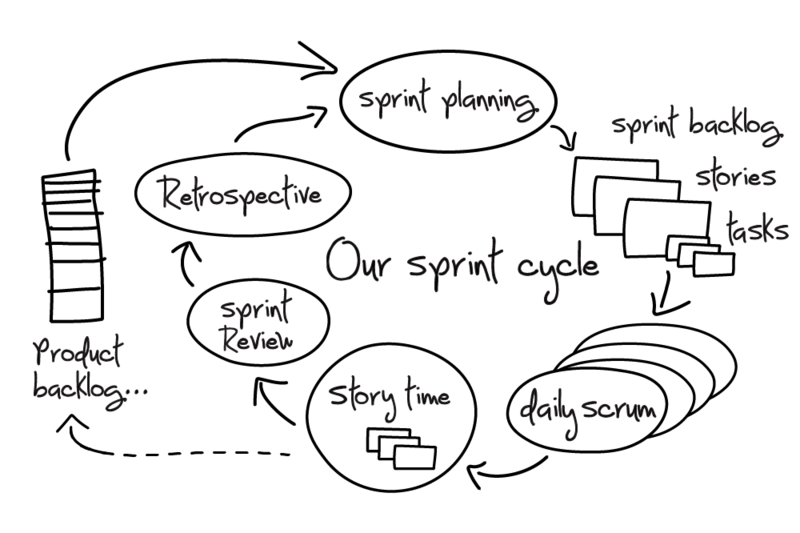 On the right is a typical sprint cycle and development model we follow. Shipping digitalisation must accompany cyber resilience for it to work effectively and safely. Cyber security is not just about a technology or a hardware, but it includes processes and practices designed to protect computers, networks, programs and data from attack, damage and unauthorised access. To achieve cyber resilience, such security includes both cybersecurity and physical security. Building cyber resilience requires coordinated efforts throughout an information system. This includes Application security, Information security, Network security, and User education, all of which we will advise our customers, in each of our digital shipping applications.